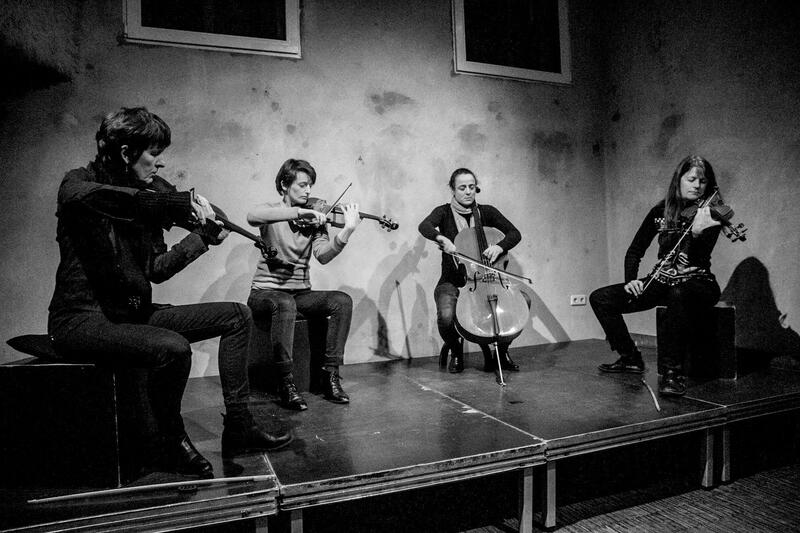 Formed in 2017, this french-swiss string quartet consisting of Patricia Bosshard, Soizic Lebrat, Anouck Genthon and Marie Schwab is nourished by differents wishes : improve in four-voices gathered in the instant of listening and favor meetings and plural writings by inviting others artists to share the space-time of their musical research and sound creations. The four-musicians focuse on the gesture as a specific-quartet catalytic playing, and on his deployment in the space. They develop a writing which anchors in desire of ensemble sound made by the convergence and the overlap of complementary sonorities. That brings a sound material which is continually spread out, living and moving within its own transformation. Enriched by the diversity and the transversality of their differents experiences (ONCEIM, CH.AU, NEC, IMO, Ensemble Un, Cie Dynamo, Circonvolutions, Double Frictional Wheel), these four-musicians create together an unusual and singular sound synergy.